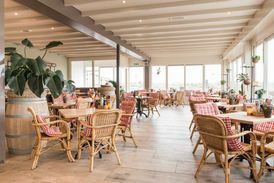 Noordwijk has a wide range of cosy restaurants on offer which serve gourmet lunches and dinners. There truly is something for everyone; Dutch delicacies, freshly fried fish, a quick snack, or top-notch culinary delights. Your meal can be savoured in ambiences ranging from friendly bistros to award-winning restaurants. Of course all this can be complemented with a glass of wine, as well as views of the sea or at least the dunes. Numerous restaurants are located on and around the boulevard. All tastes and price brackets are catered for. There are trendy beach clubs and a lively entertainment district for people who can't get enough. During November it is 2FOR1 month in Noordwijk. This is a culinary campaign, and practically almost all the Noordwijkse restaurants are participating. The restaurants offer a special 2FOR1 Menu, where you only have to pay for one Menu. Dine together for the price of one. Dine together for the price of one!